The ubiquity of this trope occurred to me recently when I was listening to Part 2 of Welcome to Night Vale’s 2nd Anniversary episode. As part of the conclusion of the episode, which wrapped up the recent Strexcorp invasion storyline, everyone and everything that wasn’t from Night Vale was ejected from the town. Unfortunately, this included Carlos, Cecil’s boyfriend, who’s now trapped in an alternate dimension. Their relationship has mostly been smooth sailing up to this point, and I can’t fault the WtNV writers for introducing some new conflict into the storyline now that Strex is gone and a mayor has been elected. But still, I was kind of sad because Cecil and Carlos’s problem-free relationship, while somewhat unrealistic for any humans, queer or not, was a safe space of angst-free queer love. I certainly haven’t found anything like that in other media; in other media being queer is apparently the equivalent of using a black cat to break a mirror underneath a ladder on Friday the 13th. A perfect example of this is the musical RENT. While RENT is often touted as a progressive musical due to its racially and sexually diverse cast, there’s a disturbing connecting thread between the two queer relationships it portrays. Angel and Collins are a doting couple—indeed, their relationship is held up as the peak of perfect love by the other characters—but they’re both suffering from AIDS and, over the course of the musical Angel’s condition worsens and he dies. Maureen and Joann, our other queer couple, constantly fight because of Maureen’s philandering—let’s not even get into the “bi girl can’t commit” stereotypes there—and eventually break up at Angel’s funeral. By the end of the musical, both of our queer couples are split up and one of the four of them is dead. Once Upon A Time also plays the sad queers game with Mulan. The show strongly implies that she’s in love with Aurora, and Mulan even goes so far as to try and confess something important to her. However, she selflessly sacrifices her feelings and leaves her friend to join the Merry Men without confessing when she realizes her affections aren’t returned. OUAT gets props for finally including a gay character, but queer people everywhere are left with the message that they can exist but they’ll probably never get to be with the one they love. I had plenty of complaints about the brief recent run of Fearless Defenders, but one thing that really grated on me was that the author obviously considered himself progressive for including a lesbian protagonist and a love interest for her. Unfortunately, the new character, Annabelle, is first fridged to cause angst for our heroine Valkyrie, and then brought back to life—at a cost: she has to share a body with Valkyrie, and therefore they can never be together because they can never be awake at the same time. That certainly doesn’t sound like a happy ending to me. These are just a few examples, but there are plenty more where they came from. What about the comical Supernatural episode “Ghostfacers”, where the gay intern is murdered by an evil spirit and the hilarious punchline of the episode involves the straight object of his affections deigning to play gay long enough to send his spirit on from this world? There‘s Torchwood, which is so consistently depressing that it’s taken me years to watch its brief four-season run because I have to recover from the angst between episodes. In Game of Thrones, Renly Baratheon was (in my humble opinion) the only claimant to the throne who showed potential to be a decent and just ruler but, whoops, he’s dead. Which clone is currently suffering from a terminal illness on Orphan Black? Cosima, the gay one, obviously. 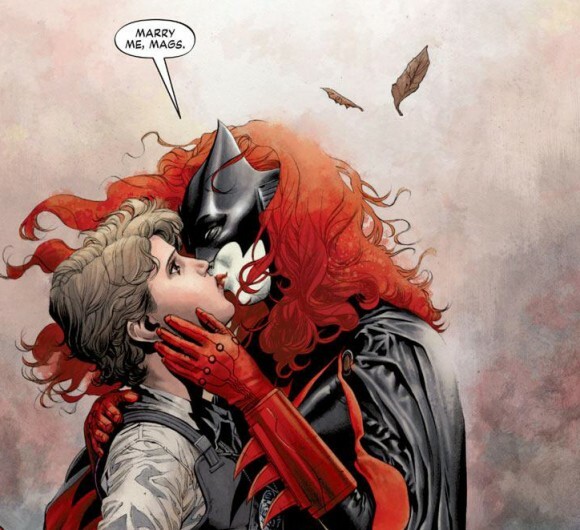 Even Batwoman, which showed promise as a story with angst and drama within the plot but generally pleasant resolutions in Kate’s romantic life, was knocked down a peg when its Powers That Be forbid Kate’s marriage to her girlfriend. And while some of these I can chalk up to bog-standard lazy homophobia—I’m looking at you, Supernatural—I’m not sure why some of these examples display this trend. Many of the writers, producers, and other staff involved with these stories are queer themselves—Torchwood’s Russell T. Davies comes to mind—why would they only tell sad stories about people like themselves? Orphan Black‘s writing team has demonstrated a clear respect for its queer characters insofar as letting them be well-rounded, independent people with their own storylines is concerned, so why out of all of the clones would they give the gay one the terminal illness? Is there some insidious strain of homophobia out there so internalized that these creators don’t realize they’re perpetuating it? Are they being pressured by their producers to spin these storylines the way they do? Queer characters deserve to be represented on screen and on the page, and more importantly, their relationships deserve to be treated with the same weight and respect as straight relationships. Sure, realistically, not all relationships will end happily, but some of them do, and right now media does not reflect that. It’s not enough to simply put the characters there in the background, and it’s certainly not enough to turn them into tragedies. It’s hard enough being a queer consumer of media without being told that the only stories we can be a part of end in tears. This entry was posted in Comics, Game of Thrones, LGBTQ+ Issues, Musicals, Once Upon a Time, opinion, Orphan Black, Sexualized Saturdays, Supernatural, tv show, Welcome to Night Vale, Women of DC, Women of Marvel and tagged Batwoman, Fearless Defenders, game of thrones, kate kane, Mulan, once upon a time, orphan black, queer representation, Rent, Supernatural, torchwood, Welcome to Night Vale by Lady Saika. Bookmark the permalink. I only just discovered your website. I really like it. It’s insightful and very well done. I love your pics and a lot of your opinions on the shows I love are spot on. Keep up the great work and I’ll keep visitng. I wholeheartedly agree. This is a motif that’s very common in movies and TV. The tragic gay couple has been used in nearly every TV show with a queer couple in it. Buffy, Torchwood, Teen Wolf, True Blood, and movies like Brokeback Mountain, where one of the couple must die. I completely agree. Carlos better come back soon, although I’m glad it’s more like a temporary LDR with cell phones than a tragedy. It’s important to have our Brokebacks and AIDS stories, but they have to be balanced with other narratives that are not tragedies. I want to be able to choose a happy narrative or an angsty one, not just have the one sad choice. Torchwood really pissed me off because I do like some DW-style angst, but now I’m afraid if any characters in other shows hook up one of them has to die. Thanks for commenting! Yeah, it’s definitely important that we have stories that showcase the very real struggles that queer people go through, but it’s also so important that we have the choice to see happy endings as well. It’s gotten to a point where I get excited when movies (and other media) have happy endings for queer characters. I actually watched a new movie currently on the film festival circuit (“Boy Meets Girl”), which is about a transgender girl (played by a trans woman!) who is quite likely bisexual or pansexual and it has a happy ending! Trans characters portrayed by trans actors are frustratingly rare and happy endings for trans characters are pretty much unheard of. Even when discussing the movie with a friend, he was telling me that despite having watched the movie before, as he watched it again he kept worrying that the trans girl was going to be hurt or killed. It’s so common that it’s just what we have come to expect, which is really upsetting. It also seems to be more common for queer women to have unhappy endings than it is for queer men. As an example, for the most recent queer film festival I attended, in the narrative films about gay and bisexual men, the men usually ended up together and happy at the end, but for almost all the narrative films about gay and bisexual women, the women either ended up breaking off their relationships or one of them died. This is definitely something that needs to be changed. As for Cecil and Carlos, I’m hopeful that Carlos will find his way back to Night Vale. And at least they can still communicate. Right?! It’s so sad that that’s the state of things – “You’ll never guess – I saw a movie with a bisexual character and they didn’t erase his identity!”; “I saw a movie with a trans girl in it and she didn’t die!”… I guess at least as long as we’re supporting the ones that have happy endings maybe someone will get the picture that those are the stories we really want to and need to see. I’m hopeful for Night Vale, at least. I trust the writers enough that I don’t think they’ll keep the two apart for too long. It is a source of eternal annoyance that I didn’t bookmark this, but I once read that a bad ending for gay characters was a major part of anti-obscenity movements in US media. You COULD have a lesbian, she just needed to be a bad person and die horribly. And, lots and lots of both pulp and literary entertainment both took this approach. I think it’s a case of, eventually, once you’ve read 40 variations on a story, that’s the story that feels right to the author. Their muses tell them the gay character should die. 😉 And, as you acknowledge, many of these stories are places where every character gets broken up sooner or later–it just grates more on the queer character, because we have fewer examples of The Queer Who Lived. I think what you’re talking about is part of the Hays code, which I … totally forgot about until just now, but which I’m sure had a significant effect on queer representation in early film at least. I don’t know much about later movements. I have been wondering about this for ages now! I remember a teacher once mentioning that black characters originally had a very disappointing tendency to die tragic deaths when they first began to be portrayed as more full characters. My personal theory is that all previously “dehumanised” minorities have to go through a period of tragic story arcs in order to become fully human characters with whom most viewers can sympathise. In other words: It’s possible to judge a happy character with the full force of your prejudices, whereas pain, suffering and death all have a real chance of circumventing the viewer’s prejudices. On a deep personal level it is harder not to sympathise with heartbreaking sorrow. In a way *we* experience the pain and sorrow as well, a bit like when we see someone get hit hard and we spontaneously give word to the pain as if we had felt the blow ourselves. I would love to hear someone else’s take on this! Pingback: Can a transgender actor ever be just an “actor”?